R and S configurations are found by ranking substituents on a chiral carbon. This is relatively straight-forward when substituents contain 1-3 atoms. This gets more confusing when the substituents are long, complex, and contain many of the same atoms. This orgo tutorial video shows you how to approach lengthy and complex substituents so that you can quickly and easily determine R and S configurations. 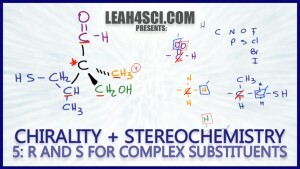 This is Video 5 in the Chirality/Stereochemistry Video Series. Click HERE for the entire series. What happened to video #4 when group 4 is in the plane of the page?? Thats the one I have the most trouble with?! best explanation for reversing the direction when #4 is forward ! what if there is a triple bond? I have a very important question! What if the CH3 would be “fat-lined”, meaning looking straight at us! Would the chirality then turn from R to S like it does when a H is looking directly at us, or does it stay how it is and that rule only applies to H.
Help would be very much needed!